It is by far the biggest city in Lebanon. Due to Lebanon's small size the capital has always held the status as the only true cosmopolitan city in the country, and ever since the independence, has been the commercial and financial hub of Lebanon. 20km to its North is Jounieh, a city very closely associated with Beirut. Beirut is Lebanon's seat of government and plays a central role in the Lebanese economy, with most banks and corporations based in its Central District, Badaro, Rue Verdun, Hamra and Ashrafieh. Following the destructive Lebanese Civil War, Beirut's cultural landscape underwent major reconstruction.Identified and graded for accountancy, advertising, banking/finance and law, Beirut is ranked as a Beta World City by the Globalization and World Cities Research Network. Lebanon achieved independence in 1943, and Beirut became the capital city. The city remained a regional intellectual capital, becoming a major tourist destination and a banking haven,especially for the Persian Gulf oil boom. This era of relative prosperity ended in 1975 when the Lebanese Civil War broke out throughout the country.During most of the war, Beirut was divided between the Muslim west part and the Christian east. The downtown area, previously the home of much of the city's commercial and cultural activity, became a no man's land known as the Green Line. Many inhabitants fled to other countries. About 60,000 people died in the first two years of the war (1975–1976), and much of the city was devastated. A particularly destructive period was the 1978 Syrian siege of Achrafiyeh, the main Christian district of Beirut. Syrian troops relentlessly shelled the eastern quarter of the city, but Christian militias defeated multiple attempts by Syria's elite forces to capture the strategic area in a three-month campaign later known as the Hundred Days' War. Since the end of the war in 1990, the people of Lebanon have been rebuilding Beirut, and by the start of the 2006 Israel-Lebanon conflict the city had somewhat regained its status as a tourist, cultural and intellectual center in the Middle East and as a centre for commerce, fashion, and media. The reconstruction of downtown Beirut has been largely driven by Solidere, a development company established in 1994 by Prime Minister Rafic Hariri. The city has been host to the Asian Club Basketball Championship and the Asian Football Cup and has hosted the Miss Europe pageant eight times, 1960–1964, 1999, 2001–2002. Rafic Hariri was assassinated in 2005 near the Saint George Hotel in Beirut.A month later about one million people gathered for an opposition rally in Beirut.The Cedar Revolution was the largest rally in Lebanon's history at that time. The last Syrian troops withdrew from Beirut on 26 April 2005, and the two countries established diplomatic relations on 15 October 2008. During the 2006 Lebanon War, Israeli bombardment caused damage in many parts of Beirut, especially the predominantly Shiite southern suburbs of Beirut. On 12 July 2006, the Hezbollah, code named True Promise ended with 8 Israeli deaths and 6 injuries. In response, the IDF targeted Hezbollah's main media outlets. There were then artillery raids against targets in southern Lebanon, and the Israeli cabinet held Beirut responsible for the attacks. Then on 13 July 2006 Israel began implementing a naval and air blockade over Lebanon; during this blockade Israel bombed the runways at Beirut International Airport and the major Beirut-Damascus highway in Eastern Lebanon. In May 2008, after the government decided to disband Hezbollah's communications network a decision it later rescinded, violent clashes broke out briefly between government allies and opposition forces, before control of the city was handed over to the Lebanese Army. After this a national dialogue conference was held in Doha at the invitation of the Prince of Qatar. The conference agreed to appoint a new president of Lebanon and to establish a new national government involving all the political adversaries. As a result of the Doha Agreement, the opposition's barricades were dismantled and so were the opposition's protest camps in Martyrs' Square. On 19 October 2012, a car bomb killed eight people in the Beirut's neighbourhood of Achrafiyeh, including Brigadier General Wissam al-Hassan, chief of the Intelligence Bureau of the Internal Security Forces. In addition, 78 others were wounded in the bombing. It was the largest attack in the capital since 2008.On 27 December 2013, a car bomb exploded in the Central District killing at least five people, including the former Lebanese ambassador to the U.S. Mohamad Chatah, and wounding 71 others. Beirut sits on a peninsula extending westward into the Mediterranean Sea, about 94 km (58 mi) north of the Lebanon-Israel border.It is flanked by the Lebanon Mountains and has taken on a triangular shape, largely influenced by its situation between and atop two hills: Al-Ashrafieh and Al-Musaytibah. The Beirut Governorate occupies 18 square kilometres (6.9 sq mi), and the city's metropolitan area 67 square kilometres (26 sq mi).The coast is rather diverse, with rocky beaches, sandy shores and cliffs situated beside one another. Lebanon, specifically Beirut and its suburbs, suffered a massive garbage crisis, mainly from July 2015 up to March 2016. The issue began when authorities shut down the main landfill site originally for Beirut's garbage southeast of the city and failed to provide any alternative solutions for months. As a result, garbage mounted in the streets in Greater Beirut and caused protests to erupt, which sometimes invoked police action. This problem was commonly blamed on the country’s political situation. This garbage crisis birthed a movement called "You Stink" which was directed at the country's politicians. March 2016, the government finally came up with a so-called temporary solution to establish two new landfills East and South of the city to store the garbage. Several municipalities across the country, in an unprecedented move, began recycling and managing waste more efficiently, building waste-management facilities and relying on themselves rather than the central government. At the end of the civil war the Copts became another recognized confession, bringing the total number to eighteen. The original seventeen included four Muslim sects: Sunni 23%, Shi'a 41%, 'Alawi 10%, and Druze 2%; Twelve Christian sects: Assyrians 3%, Syriac 1%, Catholics 15%. Syriac Orthodox 4%, Chaldean1 1%, Maronites 16%, Roman Catholics 1%, Greek Catholics 1%, Greek Orthodox 1%, Armenian Orthodox 1%, Armenian Catholics 1%, evangelicals, and smaller Christian sects, which are considered one group; and Jews but very few remain in Lebanon today,children of Lebanese Jewish parents may register as citizens at Lebanese Embassies. Family matters such as marriage, divorce and inheritance are still handled by the religious authorities representing a person's faith,the Ottoman millet system. Calls for civil marriage are unanimously rejected by the religious authorities, but civil marriages held in another country are recognized by Lebanese civil authorities. Until the mid-20th century, Beirut was also home to a Jewish community in the Bab Idriss sector of Zokak el-Blat. Before the civil war the neighborhoods of Beirut were fairly heterogeneous, but they became largely segregated by religion since the conflict. East Beirut has a mainly Christian population with a small Muslim minority, while West Beirut has a Sunni Muslim majority with small minorities of Christians and Druze. Since the end of the civil war, East and West Beirut have begun to see an increase in Muslims and Christians moving into each half. The southern suburbs are populated largely by Shia Muslims, while the eastern and northern suburbs are largely Christian. In an area dominated by authoritarian or militarist regimes, the Lebanese capital was generally regarded as a haven of libertarianism, though a precarious one. With its seaport and airport—coupled with Lebanon's free economic and foreign exchange system, solid gold-backed currency, banking-secrecy law, and favourable interest rates—Beirut became an established banking centre for Arab wealth, much of which was invested in construction, commercial enterprise, and industry mostly the manufacture of textiles and shoes, food processing, and printing. The economy of Beirut is diverse, including publishing, banking, trade and various industries. During that period, Beirut was the region's financial services center. At the onset of the oil boom starting in the 1960s, Lebanon-based banks were the main recipients of the region's petrodollars. The Banking System is the backbone of the local economy with a balance sheet of $152 billion at the end of 2012, nearing 3.5 times the GDP estimated at $43 billion by the IMF. Bank deposits also increased in 2012 by 8% to 125 billion dollars, 82 percent of the sector's assets. Banks are still attracting deposits because the interest rates offered are higher than the ones in Europe and the United States. Beirut's foreign reserves were still close to an all-time high when they reached $32.5 billion in 2011 and analysts say that the Central Bank can cover nearly 80 percent of the Lebanese currency in the market. This means that the Central Bank can easily cope with any unforeseen crisis in the future thanks to the massive foreign currency reserves. The passing of the banking secrecy law on 3 September 1956, subjected all banks established in Lebanon as well as foreign banks' branches to the secret of the profession. Both article 16 of law No. 282 dated 30 December 1993 and article 12 of decree No. 5451 dated 26 August 1994, offer exemptions from income tax on all interest and revenues earned on all types of accounts opened in Lebanese banks. On the first of April 1975, decree No. 29 established a free banking zone by granting the Lebanese government the right to exempt non-residents' deposits and liabilities in foreign currency from: the income tax on interest earned, the required reserves imposed by the Banque Du Liban by virtue of article 76 of the Code of Money and Credit, the premium of deposit guarantee imposed on bank deposits to the profit of the National Deposit Guarantee Institution. Before the Lebanese Civil War, Beirut was widely regarded as The Paris of the Middle East,often cited as a financial and business hub where visitors could experience the Levantine Mediterranean culture. Beirut's diverse atmosphere and ancient history make it an important destination which is slowly rebuilding itself after continued turmoil. Although in recent times, certain countries such as the United States frequently place Lebanon and Beirut in particular, within their travel warnings list due to a large number of car bombings and orchestrated political violence. According to the 2012 tourist statistics, 34% of the tourists in Beirut came from states within the Arab League, 33% came from European countries mainly France, Germany, and Britain, and 16% from the Americas about half of which are from the United States. The largely pedestrianized Beirut Central District is the core of the Beirut tourism scene. The district is a cluster of stone-façade buildings lining arcaded streets and radial alleyways. The architecture of the area is a mix of French Architecture and Venetian Gothic architecture mixed with Arabesque and Ottoman Architecture. The district contains numerous old mosques and crusader churches, as well as uncovered remnants and ruins of the Roman era. The District contains dozens of restaurants, cafes and pubs, as well as a wide range of shopping stores mainly in Beirut Souks. High-rise hotels and towers line the district's New Waterfront, marina and seaside promenade. 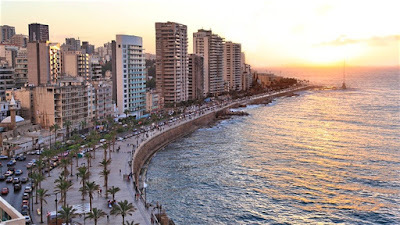 Another popular tourist destination in Beirut is the Corniche Beirut, a 4.8 km (3 mi) pedestrian promenade that encircles the capital's seafront from the Saint George Bay in the north all the way to Avenue de Paris and Avenue General de Gaulle south of the city. The corniche reaches its maximum height above sea level at Raouché, a high-rise residential neighborhood rising over a giant white limestone cliff and facing the recognizable off-shore Raouché Rocks. Badaro is one of Beirut's most appealing neighborhoods, a lovely place to stroll during daytime and a destination for going out in the evening. Badaro is within Beirut's green district with a 75-acre (30-hectare) public park,the Beirut Pine forest and a 50-acre (20-hectare) hippodrome. It is a neighborhood on a very human scale with small groceries around every corner. The neighborhood residents, a mix of old impoverished Christian bourgeoisie, bohemian style people in their 30's and well-established urban professionals, are loyal to local bakery and pastry shops. Because of the blossoming cafe and bar scene it has become lately a hip destination for Beirut's young and restless but old Beirutis remember that Badaro was already Beirut's version of the Village in the swinging sixties. Groceries and eateries can be found on almost every street of the area. There are dozens of restaurants, pubs and sidewalk cafes of virtually every style. Badaro "Village" thrives on local residents, day-trippers and hipsters from all over Beirut, office employees and many expatriates. Contrary to areas such as Gemmayze or Mar Mikhael, despite being very lively, pubs and cafes are keen on avoiding to make a lot of noise, and people are respectful and do not do things in public that they wouldn't want someone to do in front of their house. The street is a large concentration of shopping stores, boutiques, restaurants, banks, street vendors, sidewalk cafes, newspaper kiosks, and a booming nightlife spurred by students from the neighboring American University of Beirut. The AUB campus is another popular visitor destination, composed of a cluster of 19th century red-roofed buildings dispersed on a wooded hillside overlooking the Mediterranean. Gemmayzeh is Beirut's artistic Bohemian quarter, full of narrow streets and historic buildings from the French era. It is located East of the Beirut Central District, bordering the Saifi Village. The neighborhood is well known for its trendy bars and pubs, cafes, restaurants and lounges; most are directly located on Rue Gouraud, the main thoroughfare that cuts through the middle of the district. Gemmayzeh is a SoHo by the Sea, due to its colorful and chic cafes amid 1950s apartment buildings and hole-in-the-wall shops. Beirut is a destination for tourists from both the Arab world and West. In Travel + Leisure magazine's World Best Awards 2006, it was ranked 9th best city in the world. That list was voted upon shortly before the 2006 Lebanon War broke out, but in 2008 The Guardian listed Beirut as one of its top ten cities in the world. The New York Times ranked it at number one on its 44 places to go list of 2009. 2011 MasterCard Index revealed that Beirut had the second-highest visitor spending levels in the Middle East and Africa, totaling $6.5 billion. Beirut was chosen in 2012 by Conde Nast Traveler as the best city in the Middle East, beating Tel Aviv and Dubai. Like other forms of tourism, medical tourism in Lebanon is on the rise recently. Although visitors from neighboring Arab nations make up the bulk of medical tourism patients here due to its proximity, Beirut is strongly trying to woo more southern Europeans, Asians and North Americans to its land. Its Agency for Investment Development in Lebanon reports that growth in the medical tourism industry is growing by up to 30% a year since 2009. The country's tourism ministry is working closely with the medical sector and top-class hotels to create an organized, quality medical destination. Major hotel and spa chains work with local clinics, travel agencies and the tourism ministry to create comprehensive healthcare and recuperation packages for foreign visitors. The government is highly involved in this industry and strives to make the process as easy as possible. Cosmetic surgery is a major component of medical tourism in Lebanon. Most of the foreign patients come for routine operations like plastic surgery, dental or eye surgery, and Beirut's hospitals are also capable of performing specialized procedures such as internal bypass surgery and other technical treatments. Its top clinics and hospitals like Sahel General are equipped to handle the full range of surgical procedures. Beirut-based Clemenceau Medical Center (CMC), affiliated with Johns Hopkins International, was ranked one of the world's top ten best hospitals for medical tourism in 2012. The city is home to numerous international organizations. The United Nations Economic and Social Commission for Western Asia (ESCWA) is headquartered in downtown Beirut, The Arab Air Carriers Organization (AACO), the Union of Arab Banks and the Union of Arab Stock Exchanges are also headquartered in the city. The International Labour Organization (ILO) and UNESCO (United Nations Educational, Scientific and Cultural Organization) both have regional offices in Beirut covering the Arab world. The city's renovated airport is the Rafic Hariri International Airport, located in the southern suburbs. The Port of Beirut, one of the largest and most commercial in the eastern Mediterranean, is another port of entry. As a final destination, Lebanon can be reached by ferry from Cyprus via the nearby city of Jounieh or by road from Damascus via the Beqaa valley in the east. Beirut has frequent bus connections to other cities in Lebanon and major cities in Syria such as Homs and its capital Damascus. There are a number of different companies providing public transport in Lebanon. The publicly owned buses are managed by Office des Chemins de Fer et des Transports en Commun OCFTC – Railway and Public Transportation Authority. Buses for northern destinations and Syria leave from Charles Helou Station. The culture of Beirut has evolved under the influence of many different peoples and civilizations, such as Greeks, Romans, Arabs, Ottoman Turks and French. The law school in downtown Beirut was one of the world's earliest and was considered to be a leading center of legal studies in the Eastern Roman Empire. Beirut hosted the Francophonie and Arab League summits in 2002, and in 2007 it hosted the ceremony for the Prix Albert Londres, which rewards outstanding francophone journalists every year. The city also hosted the Jeux de la Francophonie in 2009. In the same year it was proclaimed World Book Capital by UNESCO. Beirut has also been called the party capital of the Arab world. Rue Monnot has an international reputation among clubbers, and Rue Gouraud in districts such as Gemmayze and Mar Mikhael have emerged as new hotspots for bar patrons and clubbers, as well as The Alleyway in Hamra Street. The National Museum of Beirut is the principal museum of archaeology in Lebanon. It has about 1,300 exhibits ranging in date from prehistoric times to the medieval Mamluk period. The Archaeological Museum of the American University of Beirut is the third oldest museum in the Middle East, exhibiting a wide range of artifacts from Lebanon and neighboring countries. Sursock Museum was built by the illustrious Sursock family at the end of the 19th century as a private villa for Nicolas Sursock, and then donated to the Lebanese state upon his death. It now houses Beirut's most influential and popular art museum. The permanent collection shows a set of Japanese engravings, numerous works of Islamic art and classic Italian paintings, while temporary exhibitions are also shown throughout the year. The Robert Mouawad Private Museum near Beirut's Grand Serail exhibits Henri Pharaon's private collection of archaeology and antiques. Planet Discovery is a children's science museum with interactive experiments, exhibitions, performances, workshops and awareness competitions. The Saint Joseph University opened the Museum of Lebanese Prehistory in 2000, the first prehistory museum in the Arabic Middle East, displaying bones, stone tools and neolithic pottery collected by Jesuits. In October 2013, Mim Museum, a private mineral museum, opened its doors to the public. It has on display some 1600 minerals from more than 60 countries. mim museum's collection is considered to be one of the world's paramount private collection for the variety and quality of its minerals. A didactic circuit, accompanied by screens showing films and scientific applications of mineralogy, will reveal a world of unsuspected marvels—priceless both from an aesthetic and scientific point of view. Mimodactylus libanensis mimo, the fossil of a pterodactyl is featured in a special wing. This one-of-a-kind complete specimen in the Middle-East was found in Lebanon. It is promoted by means of state-of-the-art modern techniques: a hologram, an auto-stereoscopic movie, a full-scale reconstitution and a game fly with mimo – an entertainment that delights children and adults. Moreover, mim hosts a thematic exhibition of 200 marine fossils. Fish’n’Stone was organized with the collaboration of Memoire du Temps. Known throughout the world, those fossils were quarried in the Lebanese mountains. The history of the fossil formation is shown through an animation that submerses you in the marine life – a time capsule that takes you in a journey to some 100 million of years ago. The Lebanese capital hosted the Mediterranean Games in 1959, FIBA Asia Champions Cup in 1999, 2000, 2012, the AFC Asian Cup in 2000, and the FIBA Asia Cup in 2010. Beirut was the host city for the 6th Annual Games of the Jeux de la Francophonie in 2009. Beirut also hosted the Pan Arab Games in 1957, 1997, and did so again in 2015. In 2017, Beirut will also host the 2017 FIBA Asia Cup. There are hundreds of art galleries in Beirut and its suburbs. Every year hundreds of fine art students graduate from universities and institutions. Artist workshops exist all over Lebanon. The inauguration of the Beirut Art Center, a non-profit association, space and platform dedicated to contemporary art in Lebanon in the Mkalles suburb of Beirut added to the number of exhibition spaces available in the city, with a screening and performance room, mediatheque, bookstore, cafe and terrace. Adjacent to the latter is the Ashkal Alwan Home Workspace, a venue hosting cultural events and educational programs. A number of international fashion designers have displayed their work in big fashion shows. Most major fashion labels have shops in Beirut's shopping districts, and the city is home to a number of local fashion designers, some of whom like Elie Saab, Yara Farhat, Reem Acra, Zuhair Murad, Georges Chakra, Georges Hobeika, Jean Faris, Nicolas Jebran, Rabih Kayrouz and Abed Mahfouz have achieved international fame. Beirut was named the top place to visit by The New York Times in 2009,and as one of the ten liveliest cities in the world by Lonely Planet in the same year. According to a 2010 study by the American global consulting firm Mercer comparing high-end items such as upscale residential areas and entertainment venues, Beirut was ranked as the 4th most expensive city in the Middle East and 15th among the Upper Middle Income Countries included in the survey. Beirut came in first place regionally and 10th place internationally in a 2010 study by EuroCost International about the rental markets for high quality housing. The 2011 MasterCard Index revealed that Beirut had the second-highest visitor spending levels in the Middle East and Africa, totaling $6.5 billion. Beirut was chosen in 2012 by Conde Nast Traveler as the best city in the Middle East. In 2013, Conde Nast Traveler ranked Beirut in the top 20 best cities in the world. Downtown - Located in the side of the city beside the Beirut port and Beirut marina; includes many shops, hotels, and Beirut souks modern shops districts. Also home to many historical sites and old churches and mosques. Badaro - Located at the heart of Beirut, Badaro is the Village of Beirut in the green district. A very active Pub and Café scene with a mix of Bohemian and yuppies crowd. Hamra - A hive of activity, and a shopping-lover's paradise. Hamra became the center during the troubles in the 70's. The more popular places are Bliss st., Hamra st., Sourati st. and Jeanne d'Arc st., each havings its own share of cafés, hotels, and restaurants. Hamra st. in particular has been redeveloped in recent years, with larger chains of restaurants and cafes opening there, including Starbucks, Costa, Nandos, Roadsters, and Applebees. There has also been a revitalization of the pub scene, with over a dozen bars and pubs operating in the area. Manara - The north-westernmost district of Beirut. Ras Beirut literally translates to the head of Beirut due to its location on the tip of peninsula, home to the Manara Lighthouse and various beach clubs though none feature any sandy beaches. Verdun - A trendy shopping area south of Hamra and east of Raouche, Rue Verdun or Verdun st. is the main area where you'll find many hotels and shops. The area also features cafes and restaurants. Many Gulf Arabs stay here during summer vacations. Gemmayze - This neighbourhood east of Martyrs Square and north of Achrafieh hosts many bars and at least one nightclub called Yukunkun. Its popularity has been fading since bars opened further down Gouraud Street in Mar Mikhael's Armenia Street in the early 2010s, but it remains one of the most important magnets for party goers. Monot Street - Technically in the central Saifi area but with a different feel from the posh boutiques in the area's core this was a popular nightspot in the first decade of the 21st century before the bar scene shifted to Gemmayze and Mar Mikhael. It still is home to several bars and restaurants. Charles Helou Station lies approximately one kilometer east of Nejmeh Square, on Charles Helou Avenue, facing the Beirut Port. From there you can take the city buses or hop onto the larger coaches that link Beirut with the neighboring cities. The two other main hubs are Cola in the south of the city and Dora in the north-eastern suburb of the same name. The Beirut Central District (BCD) or Centre Ville is the name given to Beirut's historical and geographical core by Solidere, the vibrant financial, commercial, and administrative hub of the country. It is an area thousands of years old, traditionally a focus of business, finance, culture and leisure. Its reconstruction constitutes one of the most ambitious contemporary urban developments. Due to the devastation incurred on the city center from the Lebanese Civil War, the Beirut Central District underwent a thorough reconstruction and development plan that gave it back its cultural and economic position in the region. Ever since, Beirut Central District has evolved into an integrated business and commercial environment and the focus of the financial activity in the region. That evolution was accompanied with the relocation of international organizations, reoccupation of civic and government buildings, expansion of financial activities, and establishment of regional headquarters and global firms in the city center. Assessment of the demand for build-up space in the BCD has been done in reference to a number of macro-economic, demographic, and urban planning considerations at a time of marked need for new activity poles in the city, such as Souks, financial, cultural and recreational centers. The district's total area is 4,690,000 square metres (50,482,740 square feet), the majority of which is dedicated to residential space 1,924,000 square metres or 20,709,764 square feet. The Beirut Central District contains over 60 gardens, squares and open spaces. These spaces comprise landscaped streets, gardens, historical squares, pedestrian areas and sea promenades thus totaling to an area of 96 acres (39 ha) of open spaces. The central district is Lebanon's prime location for shopping, entertainment, and dining. There are over 100 cafes, restaurants, pubs and nightclubs open in the Beirut Central District, and over 350 retail outlets distributed along its streets and quarters. Beirut Souks alone are home to over 200 stores and a handful of restaurants and cafes. Beirut Souks are the Central District's old medieval market, recently renovated along with the original Hellenistic street grid that characterized the old souks and the area's historical landmarks along long vaulted shopping alleys and arcades. Solidere, the company responsible for the reconstruction and renovation of the district, organizes music and entertainment events all throughout the year like the Beirut Marathon, Fete de la Musique, Beirut Jazz Festival. However, the means of urban development in this particular area of the city was subject to much criticism and controversy. Rafic Hariri, who would later become prime minister, was the majority stakeholder of the company, which raises concerns of conflict of interest in the context of a public-private partnership. Many of the expropriations that have made the project possible have been made at land undervalued land rates, and partly paid in company share. Strict urbanization laws were put in order to oblige people to sell and not renovate themselves. Today, Solidere acts as a de facto municipality thus this quarter of the city is effectively privatized. It is for example forbidden to ride bikes on Zeituna Bay, a marina where many restaurants are located, and these laws are enforced by private security guards not national or municipal police. The project was also criticized for destroying some of the city's architectural and cultural heritage. Among the hundreds of destroyed buildings were the last Ottoman and medieval remains in Beirut,wrote American University of Beirut professor Nabil Beyhum in the Journal The Beirut Review in 1992. Much of the damage had been done through unapproved demolitions in the 1980s and early 1990s, bringing down some of the capital’s most significant buildings and structures, wrote UCLA professor Saree Makdisi in the journal, Critical Inquiry, in 1997. Moreover, many of the traditional privately owned shops in the Beirut Downtown were replaced by luxury outlets and high-end restaurants that only few people could afford. Most of public spaces promised by Solidere since the start of the reconstruction, such as The Garden of Forgiveness, a central park, and an archeological museum, remain unfinished putting into question the actual benefit of the project to the population. Following World War II, Lebanon gained its independence from France and Beirut became its capital in 1943 - Bechara El-Khoury and Riad El-Solh, Lebanon's first president and prime minister respectively, are considered the founders of the modern Republic of Lebanon and national heroes. Beirut thrived as a major commercial and tourist center of the Middle East. It was a top destination among wealthy Arabs and European tourists, due to Beirut's unique geography, climate, diverse culture, and freedom. Beirut was seen as the European gateway to the Middle East and vice versa, and was often called the Paris of the Middle East. The city has severely suffered from a 15 year long civil war that ravaged the country from 1975 to 1990. It quickly was divided in a Western part controlled by Pan-Arabist Lebanese and Palestinian militias inclined to socialism and an eastern part under control of nationalist Lebanese militias leaning towards fascism. The front line was for most of the time along the roads Damascus Street and Old Saida Street. The central area of the city, previously the focus of much of the commercial and cultural activities, became a no-man's land. You can still find many buildings damaged or completely ruined especially on the verges of Downtown but there are hardly any efforts to keep the memory of those bloody days alive. The conflict is often misleadingly portrayed as a religious conflict that divided the city in a Muslim and a Christian part. While it is true that there were massacres along religious lines many Christians lived in West Beirut throughout the war and vice versa and most militias had Christian, Muslim, and at least some communist factions atheist members. Since the end of the war in 1989, the people of Lebanon have been rebuilding Beirut. The city has undertaken an aggressive rebuilding policy. It has been working hard to regain its status as a tourist, cultural and intellectual center in the Middle East which it has lost to Cairo as well as a center for commerce, fashion and media which is dominated by Dubai and other rich Gulf states. However Beirut with the rest of the Middle East has gained momentum. Sectarianism is still prevalent in Lebanon, as a result of the Ottoman religious system and of the French colonial policy of divide and rule, which is both reflected in the political system and social networks. Many Lebanese, especially Christians and the middle and upper classes, identify culturally with Europeans, particularly the French, and some denying Arab identity altogether. Many of them, and this might especially true for Christians, prefer to identify themselves as Phoenician referring to their ancestral roots in ancient Phoas Chrienicia. Many Muslim Lebanese on the other hand identify culturally and ethnically with other Arabs and Muslims of the Middle East. A minority claims to be Syrian in the sense of a Greater Syrian civilization stretching from Cyprus and Sinai to west Iran and from southern Turkey to northern Saudi Arabia. Most Beirutis love going out and the city offers with Tel Aviv the best night life in the whole region. If and when you go out at night, depending on the venue, dressing up well will most certainly get you some respect. The locals like to see that foreigners are doing what they can to fit in. Expect to be offered a drink or a cigarette. Alcohol is very cheap in shops and supermarkets, yet in night venues, prices can easily exceed European standards. Beirut enjoys Mediterranean climate. Come in April to June for warm, dry days and long, cool evenings (15–25°C). Temperatures in July and August rise above 30°C and humidity can be somewhat overwhelming. A room with air conditioning can help to escape the heat and to sleep easily as even the night temperatures hardly drop below 25°C. The wettest months are December to February and can bring thunderstorms with lots of rain for days so bring a good coat and umbrella. Lebanon's ski season runs from December till early April. Despite the diverse climate that changes noticeably per season, the weather is very predictable; the weather forecast, on radio and TV stations are normally very accurate, so you normally shouldn't find yourself caught in a sudden downpour in the winter months. - Labour Day (1 May). - Eid al-Fitr - Festival of the Breaking of the Fast. - Christmas Day (25 Dec). Based on the lunar calendar, Islamic holidays move forward approximately 11 days every Western year. You should cover up if visiting religious sites, such as mosques and churches. Some neighborhoods are more conservative than others, so bear that in mind when exploring the city. Going out at night is a smart affair, so dress fashionably to fit in, although this does not mean dressing up in a suit; you will find many men in sporty t-shirts, dark jeans, and smart running shoes at even the trendiest nightclubs. Beirut is very culturally diverse, quite cosmopolitan and thus multilingual. Lebanese Arabic is the native language but everyone understands but rarely speaks Standard Arabic, the official language, while English and French especially the former are also spoken by many people. Beirut is a huge city with several districts containing sightseeing, restaurant, nightlife and accommodation listings — have a look at each of them. Due to Lebanon's small size the capital has always held the status as the only true cosmopolitan city in the country, and ever since the independence, has been the commercial and financial hub of Lebanon. 20km to its North is Jounieh, a city very closely associated with Beirut. Beirut has survived a rough history, falling under the occupation of one empire after another. Originally named Berut, "The Wells" by the Phoenicians, Beirut's history goes back more than 5000 years. Excavations in the downtown area have unearthed layers of Phoenician, Hellenistic, Roman, Arab and Ottoman civilizations. The city has severely suffered from a 15 year long civil war that ravaged the country from 1975 to 1990. It quickly was divided in a Western part controlled by Pan-Arabist Lebanese and Palestinian militias inclined to socialism and an eastern part under control of nationalist Lebanese militias leaning towards fascism. Many Muslim Lebanese on the other hand identify culturally and ethnically with other Arabs and Muslims of the Middle East. A minority claims to be Syrian in the sense of a Greater Syrian civilization stretching from Cyprus and Sinai to west Iran and from southern Turkey to northern Saudi Arabia. Beirut Rafik Hariri International Airport, is the country's only international airport and the hub of Lebanon's national carrier, Middle East Airlines. Most international airlines have daily flights between Beirut and the major European capitals. The airport is located 7km south of Beirut, and is roughly a 10 to 15 minute drive from the city center. Car parking is available at the airport for around 2.5 USD per hour. Hariri is one of the first airports that provided free wifi access to the internet and still does. Due to heavy charges in phone calls, its best to log in to the airports wifi and use Skype mobile for the necessary calls. There is no official bus company serving the airport, but private minibuses depart from the 2nd (departure) level just outside the exit. These are white and sometimes red or green minivans majority are Kia Besta with red plates but no numbers in their windows, which pick up airport service people and bring them to Beirut. There are no bus stops but the buses will stop anywhere where people flag them down or give them signs with their eyes. The fare to any destination is LL 1000, but bear in mind that the buses are minivans and you might be expected to pay for an extra seat for your luggage if you need one. Minibuses from the airport go to Dora, a suburb in the north-east of Beirut, and cross right through Beirut on their way. Ask the driver for Dora when they stop. The buses run the route Airport-Dora on the transport Open Street Map of Beirut which is the same as line A on the Zawarib bus map. On their way the buses pass the local hubs Jisr al-Matar Airport Bridge, but several kilometers from the airport though, Barbeer, Bechara El-Khoury, and Sâhat esh-Shuhada (Martyrs' Square) and then follow the coastal city highway to Dora. From the places mentioned you can catch buses going to Ramlet El-Baida, Rawche, and Manara number 15 from Barbeer, stop around 8pm, Hamra number 4 from anywhere between Barbeer and Sâhat ash-Shuhada. Minibuses unlike other city lines, don't stop before midnight and Achrafieh numbers 2 and 5 from Bechara El-Khoury, stop around 7pm for example. After Sahat esh-Shuhada on the edges of Downtown the airport buses go past Gemmayze and later Ge'itawi, where most of the few Beirut budget hostels are located. Tell the driver where you want to get off as you enter and they will tell you once you're there. The bus service to the airport stops around 11pm and might stop much earlier in the opposite direction. At night you may be able to catch a service taxi if you walk along the only road leading away from the airport for about 10 minutes, just after passing a highway flyover. You might be expected to pay twice the service price, called serveeceyn, to anywhere in Beirut because of the long distance. Even if you have to catch a taxi,it will be much cheaper with no more than LL 10'000 compared to LL 30'000 at the airport. There are plentiful and comfortable taxis that are authorized by the airport. They are parked next to the terminal in the arrivals level and have an airport logo on the side with official airport taxi fares. The official price is 25 USD, or you can try to agree with any of the drivers for less. If you are not in a hurry, ask to be dropped at the closest hub, and then from there grab a service. Upon your arrival in Airport simply call a taxi from a regulated taxi company which uses standard fares and a pick up from the airport will be available in 5-10 minutes after the call, at the most. Price is fixed to 30000LL with Allo Taxi or 27000LL with Allo city smaller cabs in May 2017. However if you want to use Allo taxi its best to pre book the taxi from their web page due to availability issues on spot, that will drug you to a more expensive Allo taxi solution which is always available. If you have pre booked Allo taxi, Go out of airport Gate 3 after you have arrived at the arrival hall cross the road towards the parking then head to the middle service room. Take the elevator or stairs to level -1 then Reach out to AVIS/Budget parking by following the signs, Allo Taxi will be there waiting for you. From city centre to airport simply stop a modern-good condition taxi and prompt the driver to ride you in airport with no more than 20000LL. He will accept, cause this is the reasonable and most used price at the moment, if you dont like to make phone calls and have a scheduled pick up. Generally taxis are plentiful in Beirut and you can find them anywhere. The above is the safest and most standard fare way especially upon your arrival to airport. After the call you will wait the taxi at exit 4 of the arrivals. Regular Taxis are also available and are located a little farther from the airport, but these are not guaranteed and are to be used at your own risk. The aproximate rate Airport - Hamra street is around LL 30000. However, the so-called regulated taxis' drivers, will ask you anywhere between $ 30 to 50 for any downtown locations. So, start bargaining from $10 and stop at $15 as the upper limit, both ways to and from the Airport. Since this is only a 7 km long drive, and gas price is approx $ 1.5 / litre in Beirut, this price is definitely a rip off that taxi drivers would not miss. Taxi types are wildly changing, so pick the best and newest looking ones to guarantee aircon, and collision safety in Beirut traffic. All major car rental companies have booking offices inside the airport. Adonis Car Rental - Local car rental service. Will deliver/pickup your car at airport or anywhere else in Beirut and nearby suburbs. $25 /day. Mirna Chalouhi Center. Beirut is linked with all coastal cities through the coastal road. Entrances/exists off this road connect it to districts adjacent to the coast such as Maten and Kesrwen and others. Beirut is linked to Zahle and Baalbeck and the rest of Bekaa through Dahr Al-Baydar road linked to Emile Lahoud highway at the entrance of Beirut. - Aboudiyeh northeast of Tripoli. Stay updated with safety conditions in Syria if coming from there. There are no reports so far that border points were closed; however, check the news to stay up-to-date. Buses connect Beirut with Damascus and the south of Lebanon arrive at an intersection next to the Cola bridge. The bus stop is known as Cola among the locals. This place is in the southern part of Beirut in area known as Mazraa. There are currently two public transport companies. The OCFTC that operates a fleet of blue and white city-buses, and the LCC with a fleet of red and white minibuses; Bus fares cost either 500LL (OCFTC bus 24) or 1000LL ($0.33 to 0.67). The service is very efficient and the buses come very often. To get onto a bus you must stand at the side of the road and signal with your hand as a bus approaches; the buses will stop anywhere. The service of the numbered big buses halts between 7 and 8 at night whereas the minivans go at least until 11pm. The minibuses running along line 4 run all night but stop at the northern end of Damascus Street and don't go all the way to Hamra. Unfortunately, the bus companies don't provide any helpful information neither on the internet nor through printed maps of the lines and the bus lines underlie constant change. The Beirut transport map of openstreetmap is the most accurate bus map. To get a brief overview there is also a 2013 bus map by Zawarib, but it isn't up to date any more. Apparently, line number 5 connecting Ain Mreisse and Choueifat, line 7 and line 8 don't exist any more. Lines still existing as of April 2015 are lines 2, 4, 5 (Hamra-Jdeide), 6, 12, 15, and 24. Now there is also a seaside bahry number 15, so don't be surprised if you find a bus with a big 15 in the front screen running between Ain el-Mreisse and Dora along the shore and make sure which one you enter when you're east of Beirut river. To make matters more complicated there are also inter-city buses sporting the same numbers so you might find a bus number 6 for example in a very different area such as Hazmieh than expected and some private school buses sometimes also have numbers in their front screen. But don't worry, it's not so bad because bus drivers and fellow commuters are very helpful and ready to give advice and everybody knows about those difficulties and is confronted with them. Just give the bus drivers a sign to stop and ask for your destination as it is common in Beirut. There are also minibuses, usually white, sometimes red or green, connecting different destinations. Some of those buses run the same route as the official line 4 and they also sport a big red 4 in their screen. Most of them don't have numbers though, and you have to know respectively ask where they go. It's best to ask people waiting for a bus or a taxi by the roadside or the bus driver how to get to your destination. Service (pronounced the French way is a very common form of transport, especially with daily commuters. They are regular taxis which operate as shared taxis and cost 2000 LL compared to up to 10000 LL for a cab. Taxi drivers decide on the spot to operate as a shared taxi. A driver will try to pick up more passengers along the route, but often you will go all the way by yourself. Service drivers may choose not to take you if you are not going in the same direction as them. They also won't go the shortest way, but take some small detours in search of more passengers. Hailing a service or taxi usually entails yelling your destination to the driver when he slows down. It is important to remember that if you want a service you should give the name of the general district you want to go to and not a specific address. If the driver nods or gives you a sign to get in when they stop for you this means they accept the service price of 2000 LL. If they don't accept they will drive by or tell you "serviceyn", "taxi" or the amount they want to have and which is up for negotiation then. When you get close to your destination the driver will ask you where you want to get out. It's handy to know a landmark close to your destination as the drivers usually only know the names of the main roads and use landmarks for navigation instead. The service drivers will not take you to the exact address, unless it's on a main road, but will drop you at the closest point of the main road and will tell you in which direction to go. You can also ask to be dropped off once you recognise the area you want to be in. When you enter the car you can ask "service?" to make sure you only pay 2000 LL, but if the driver doesn't tell you a price right away this means they accept the service price and you should by no means feel obliged to pay more once you get off. People usually pay when they get off. Taxi drivers in Beirut are notorious for overcharging tourists much more so than in neighboring Syria. Most will demand absurd fares and demanding 2-3 times the service rate is very common. If you're pressed for time paying the double service price, called "serviceyn" may be a compromise (4000 LL), otherwise you may have to wait a bit to find an honest cab driver willing to take you for 2000 LL. Virtually no one tips cab drivers unless some extraordinary service has been rendered, like a very long wait time while you run an errand or something. Some drivers will ask you for a tip particularly near holidays. Payment is usually at the end of the journey. There are two types of taxis in Beirut; the sometimes old and battered hail-taxis, and the prebooking taxis. Hail-taxi - The most convenient form of transport in Beirut, as they are absolutely everywhere. Those taxis are predominantly Mercedes Benz cars though recently, due to increasing petrol prices, taxi drivers are opting for more economic forms or transport and can be quite easily identified by their yellow illuminated taxi sign on the roof and red number plate. Fixed meters aren't provided so it is recommended to ask how much your trip will cost before hopping in. The fare will be charged per destination and not per distance traveled which is an advantage since traffic is a big problem in the city. A typical journey from one side of Beirut to the other (roughly 3 km) may cost LL10 000 (€5.00). Many taxi drivers speak at least a few words of English and French. Knowing the name of your destination in the local language may solve any misunderstanding. Keep in mind the names of the landmarks around the city, as they will come in handy when traveling by public transport some drivers aren't that good at orienting. Prebook taxi - These require that you call them and book a ride, they generally cost more but are much more luxurious and are normally air conditioned. All hotels should provide you with a taxi directory, if you wish to use this type of service. Taxi prices are considered cheap if compared to US and European taxis. Major taxi companies are: Geryes Taxi, Taxi Premiere. Allo Taxi or book online to avoid phonecalls cost. Uber has been available in Beirut for some time now. The advantages are Uber calculates the fare based on distance and time, there is no negotiating a price with the driver which is especially useful as a tourist who doesn't know the distances and prices in the city. Uber will just charge your credit or debit card. You get an email receipt with a map tracing your journey, so you can check you haven't been taken for a ride like you might experience in a normal taxi. Bike activist mural in Beirut's Hamra district, Mohammad Abd al-Baqi Street. Driving in Beirut is not to be recommended for much of the day, particularly in the city center. Traffic is heavy, and impossible during rush hour. There is so much to see and being stuck in a traffic jam is the last thing anyone would want to spend their time doing. Walking around the city is much more of an experience, and is in fact necessary in the very center since that part of the city is a pedestrian area. It can be difficult to find parking other than in multi-story and off-street car parks. On-street parking, if you are lucky enough to find one, is allowed for a short time of two hours. Tickets must be purchased through the parking meters usually located at either end of a street. They can be paid by either cash or card. Overstaying your time may get you a ticket. Enforcement of the parking limit isn't done very efficiently, but obviously the last thing anyone would want to find is a ticket that will ruin their day and set them back financially. As all major towns and sights are easily accessible by public transport renting a car is recommended only if you're planing to go out into the countryside where public transport isn't operating, or maybe simply to enjoy the Lebanese see-and-be-seen lifestyle. Car rental prices range from economical 40.000L.L/day (€20.00/day) to luxury and exotic standard prices. Those can change according to season, so make sure you contact the car rental company beforehand to check prices as well as pickup/drop-off locations. Most people however will not walk throughout the city, rather they will walk within certain districts and take cars/taxis to get from one district to another. Streets are poorly signposted, often giving a number instead of the street name you will have on your map, and few Beiruti locals would know how to navigate according to their names. Directions are usually given by building placement and landmarks,straight down the road until you reach building X, turn left there, then right. Many streets have local nicknames that wouldn't match the map either. That said, if you find yourself lost in the streets, simply ask any passer-by for directions; no one will refuse to help. Otherwise you can stop at the nearest hotel or shop and ask. Hotel concierges and shop keepers will most definitely speak at least some English. Some roads and especially pavements in Beirut are in poor condition. Not so much in Downtown, but especially the farther you get from Downtown the more road works you will most probably find. Very often the pavement is used as a parking lot or it will feature a huge trash container, a street sign, a street light or some other pole right on it making it difficult or impossible to pass. So do it as the locals and walk on the streets next to the cars. Beirut was once the self-proclaimed Paris of the Middle East. It still has an outdoor cafe culture, and European architecture can be found everywhere. Many Beirutis as well as other Lebanese speak French and/or English, to varying degrees, along with Arabic. Each district has its own sights and places to visit, just some highlights of things that you really should see if you can during your visit to Beirut. Pigeon Rocks (Rawcheh District) A monumental natural arch jutting up from the Mediterranean. Great place to sit at one of the roadside cafes and watch the sun set.There is a trail that leads in the beach in front of the Rocks. Locals are offering boat ride in and around the Rocks with small fishing boats. If you dare enough to trust them go but deal the price from the start in order you not overcharged. Place de l'Etoile (Nejmeh Square)(Downtown District), originally built by the French in the early 20th century in the very center of the Downtown district, it suffered a lot of war damage during the war but recently has been restored. In the centre of the square it stands the Greek Orthodox Cathedral of Saint George which is the Mother Cathedral of Orthodox community in Beirut and the oldest church of the city. The Cathedral is attached with an underground small crypt Museum which confirms the religious use of the area in the previous centuries. Jeita Grotto is a compound of crystallized caves in Lebanon located 20 km north of Beirut in the Valley of Nahr al-Kalb (Dog River). This grotto is made up of two limestone caves, upper galleries and a lower cave through which a 6230 m long river runs. Geologically, the caves provide a tunnel or escape route for the underground river. In this cave and galleries, the action of water in the limestone has created cathedral-like vaults full of various sizes, colors and shapes of stalactites and stalagmites, majestic curtains and fantastic rock formations. The total length of the cave is more than 9000 m and there is one among the biggest stalactites in the world hanging 8,20 m. The grotto accommodates a huge hall with a distance of 108 m from the ceiling till the water level. Open Tuesday-Sunday 9am-5pm. Adult LL 18'150. National Museum Of Beirut Ras El Nabaa, South Ashrafieh. About 1,300 artifacts are exhibited, ranging in date from prehistoric times to the medieval Mamluk period mainly dealing with Lebanon's Archeology and History. A few minute video is played every hour exactly and showing the history of the museum, especially the damages during the civil war, measures undertaken to protect the antiquities and the later restoration procedure with original video footage from that era. Tu-Su 9am-5pm, closed Mon and Holidays, Fee: 5.000L.L (adult), 1.000L.L (students, under 18). AUB Museum, Bliss Street (Rue 33), Hamra / Ras Beirut. Monday. Archeology and History, the Middle East's oldest museum. Its artefacts aren't as massive as some in the National Museum but its objects are just as spectacular and they are presented in quite an appealing way. Free entrance. Sursock Museum, Sursock Street, Ashrafieh. Contemporary Modern art, the building itself is a perfect example of the typical 18th century Lebanese palace. Lebanese and international art is permanently displayed in the intricately preserved interior. Beirut Art Center, Rue. 97 (street), Sin El Fil, Greater Beirut8. Contemporary Modern art, the first non-profit public space in Beirut, housing an exhibition space, screening and performance auditorium, bookstore, mediatheque, cafe and terrace. Designed by architect Raed Abi Lama. Matignon Gallery (Lebanese and International contemporary art), Sin El Fil, Greater Beirut. Mon-Fri 10AM-6PM, Sat 10AM-2PM. DIY Beirut, Makhoul Street, Hamra. This gallery is one of the alternative culture and art places in Beirut and hosts besides exhibitions yoga classes, workshops and the odd flea market. Follow the signs from Makhoul Street or ask around. Emmagoss Gallery, School, New Jdeideh, Greater Beirut. Art on Spears, Spears Street, Qantari. Monday - Saturday 8am - 6pm. Art on Spears is located in a beautiful old building on one of the main streets leading into Hamra. They host exhibitions and events. At least some of them are for free. Horsh Beirut (Beirut Pine Forest), (adjacent to the Beirut Hippodrome south of Ashrafieh); this park is now open since september 5, 2015 to the general public. Khalil Gebran Park Downtown District between Amir Amine St. and Toufik Khaled St.
Debbas Square Saifi village Downtown bewteen Charles Debbas St. and Dmascus St.
Visit any Virgin Megastores branch to ask about any upcoming events. Many live concerts are held throughout the year with international musicians and DJ's. Beirut has hosted some of the world’s biggest names in Dance music such as Armin Van Buuren, Tiesto, Above and Beyond, Bob Sinclar, Hernan Cattaneo, James Zabiela, Cosmic Gate, Paul Van Dyk, Ferry Corsten, Nick Warren, Anthony Pappa, Sasha, John Digweed, Danny Howells, Steve Lawler and others. Beirut International Film Festival. Held annually in October, the Beirut Film Festival exhibits films from all over the middle east, usually in either Arabic or French. The films vary enormously and some can be intensely political. Beirut International Jazz Festival. Held annually during the month of July over a period of four days, some of the greatest international jazz artists as well as musicians from around Lebanon play some quality music near the Beirut marina. Festival du cinema francophone, Held between the month of march and April over a period of two weeks, films are in French. Cinema Metropolis - Masrah Al Madina, Beirut. There are many things to do in Beirut. Walk, jog, skate, cycle, stroll or whatever you consider exercise along Paris Avenue which links up to General De Gaulle Avenue both locally known simply as the corniche which stretch around the entire Central Beirut perimeter (approx. 5km). Start the walk, jog, skate etc. at the Beirut marina in Downtown Beirut District about an hour or so before sunset and finish at the Pigeon Rocks in Rawcheh, in time to watch the sun go down while sipping on a drink at one of the outdoor cafes. Soak up the sun on the public beach Ramlet al-Baida or in one of the beach clubs on the Beirut coast. Very few actually have sandy beaches, and most unfortunately have been converted into spas with swimming pools and paved terraces, but despite all that, they all have access to the sea. A few of them are completely private and members-only, but can be accessed by paying for a guest ticket if going in with a member. The Saint George Yacht club in Ain El Mreisseh and the Riviera Beach and Yacht Club at the Riviera Hotel are two such popular clubs, where access to the beach club for non-members is US$20 per day. You can chill in one of the pools or have a drink at the bars and cafes while listening to music in the afternoons. Long Beach Club is another good place. The entrance is just to the left of the Ferris wheel on the Cornich right before the hill. Bring a beach towel. Test your golfing skills at The Golf Club of Lebanon (18 hole), Ouzai - Beer Hassan,Beirut next to Henry chehab barrack. Take a ride on the Beirut Balloon,30 passenger helium filled balloon, offering breathtaking views from an altitude of 300m. ), Allenby St., Downtown Beirut,Entrance is through Biel Convention Centre. Look for it in the sky. 10AM-10PM. Scuba Dive, With 300 sunny days a year, 36 shipwrecks, impressive walls, canyons, caves, Ray habitats and shark habitats, Beirut definitely has something to offer for a serious scuba diver. The French WWII submarine Le Souffleur, the British freighter Alice B which sank during the civil war in the 80's. The Macedonia freighter which sank in 1962 and the National Star freighter in 1991, the Mediterranean flagship of Admiral Sir George Tryon HMS Victoria which sank in 1893, The British Lesbian which sank during WWII, make just a few of Beirut's shipwreck collection. Historical cities dot ancient Phoenicia' s shore, providing us today with many interesting submerged historical sites, some littered with Phoenician and Roman marble stones, granite columns, pathways, old stone anchors, amphorae and bits of pottery. NISD National Institute for Scuba Diving, Solidere Beirut Marina, Downtown Beirut. LD (Lebanon Divers), Mardelli Building 2nd Floor, Saide Street Ashrafieh - Beirut. Atlantis, Bel Azur Hotel, Jounieh, Greater Beirut. Every Sunday in the Beirut Hippodrome, officially called Hippodrome Du Parc De Beyrouth. The hippodrome is home to popular horse races, attracting a dedicated betting crowd often old taxi drivers. Foreigners should join the fun in the afternoon for free entrance ID or passport required. Open on Sundays only. AUB - American University of Beirut - The American University of Beirut (AUB) was founded in 1866 as a private, independent, non-sectarian institution of higher learning, functioning under a charter from the State of New York. AUB has grown from 16 students in a rented house to a major university with over 6,900 students located on a 73-acre campus overlooking the Mediterranean Sea. The University is governed by an autonomous Board of Trustees comprised of international leaders in business, education, diplomacy, engineering, philanthropy, science, and medicine. LAU - Lebanese American University - The Lebanese American University is an American institution chartered by the Board of Regents of the University of the State of New York and operating in Lebanon. Currently, LAU has two campuses: one located in Beirut, and a second in the Mount Lebanon city of Jbeil (Byblos). The university offers programs leading to Associate's, Bachelor's, and Master's degrees in the arts and sciences, and Doctorates in Pharmacy. LAU is the only institution outside of the United States with an ACPE-accredited pharmacy program. LAU is currently a candidate for accreditation by the Commission on Institution of Higher Education of the New England Association of Schools and Colleges (NEASC). USJ - Universite Saint-Joseph - A private university founded in 1875. A member of the Association of Arab Universities, the International Association of Universities, the Association of French speaking universities (AUPELF) the International Federation of Catholic Universities. The European Federation of Catholic Universities, the Association of Jesuit Institutions of Higher Learning in Europe and Lebanon and the Euro-Med University (Téthys). Lebanese University - Lebanese University - The Lebanese University is the only public institution for higher learning in Lebanon. Founded in 1951, it has 17 faculties as of 2006 and comprises various cultural, religious, and social groups of students and teachers. ALLC International House Beirut International House Beirut is the only school in the country to offer speaking-only courses in the Lebanese dialect, as well as the Cambridge CELTA (Certificate for Teaching English as a Foreign Language). IH Beirut also provides classes in Spanish, French, Italian, German and Modern Standard Arabic. ALPS Academy of Languages and Practical Skills ALPS is a program of the Institute of Middle East Studies (IMES) in Mansourieh and offers one-on-one tutorials and group classes. It also offers a weekly conversation class in Lebanese Colloquial for free to which people who don't study at ALPS the are explicitly welcome. Saifi Institute for Arabic Language Saifi Institute is the most well known of Lebanon's Arabic language schools. It is located in the Saifi Urban Gardens campus in Beirut's Gemazye district, which includes a cafe and student accommodation. Saifi Institute hosts around 120 students per 5-week term throughout the year. Courses are offered in the spoken and written communication of daily life Saifi's own curriculum called Urban Arabic, as well as Modern Standard Arabic. Berlitz Lebanon Arabic Program Berlitz Lebanon is specialized on teaching Modern Standard Arabic Fussha and Levantine dialect Spoken Arabic which includes also the Lebanese coloquial language. Their center is located in the university district of Hamra, close to the campus of the American University of Beirut and classes start throughout the year. Les Terroirs du Liban, Hourani Center, Street 609, Hazmieh. Monday - Friday 9:30 am - 6:30 pm, Saturday 9:30 am - 2:00 pm. This is the shop of the company Fair Trade Lebanon which is the local member of the World Fair Trade Organization. They ensure higher prices and long-term cooperations with the cooperatives and small-scale producers they work with. Their product range includes za'atar, olive oil, wine, syrups, jams, pickles, hummus, condiments and soap. Some of their products are organic and most of them are vegan including the soap. You can find some of their products also in organic shops and supermarkets. Beirut is the fashion capital of Lebanon and the region, with many prominent Lebanese designers located here, including Elie Saab, Tony Ward , Basil Soda, Pierre Katra and Robert AbiNader. ABC Mall, Achrafieh Alfred Naccache Street, Mar Mitr. Many international brands are here along with great restaurants, cafes, and a movie theater all in a mixed indoor/outdoor setting. ABC Beaute, Bab Idriss, downtown. Offering a wide range of international cosmetics and perfume brands, nail bar, professional hairdressers and stylists. Open Mon-Sat 10AM-7PM. Miss ABC, Hamra street, facing Cinema strand. Women's specialty store. Open Mon-Sat 9:45-7:45, closed Sunday. City Mall, Dora highway roundabout, Greater Beirut. Includes 100 stores, 15 cafes and restaurants, a Hypermarket, and 9 movie theaters. Dunes Center, Centre Dunes, Verdun Str. Displaying some of the latest shopping brands, as well as many cafes and a movie theater. Music, Books, Event Tickets: Virgin Megastores Currently four branches in Beirut: Beirut International Airport, Martyr's square Downtown claims to be the biggest Virgin Megastore outside the UK, City Mall at Dora roundabout, ABC department store in Ashrafieh. Souk El Tayeb Held every Saturday near BIEL downtown between 9AM-2PM, feed your soul as well as your face in Beirut's first organic farmer's market. Promoting traditional methods of farming and preserving, it's a great place to pick up local honey, cheese and breads, plus artisans' crafts. It also runs regular cookery classes, to learn how to make that perfect tabouleh (bulgur salad). Sunday Market. Get up early and join the locals for a rummage at the Sunday Market which opens between 7AM and 1PM, next to Beirut River in the east. You might find antique jewellery, clothing and beads, or maybe just bric-a-brac, but there's an eclectic selection of goodies on show. US Dollar (USD) notes/bills are widely accepted, but US coins are not. For the US Dollar the exchange rate is fixed at 1USD = 1500LBP (as of January 2017). Once payment is made in either currency, change will be given in Lebanese Pounds or, possibly, a combination of both US Dollars and Lebanese Pounds. Payment cards: Many shops, hotels, restaurants, bars etc accept international payment cards such as Visa, Mastercard, Maestro or American Express. But don't be surprised if your credit card is turned down, it is a common occurrence; certain cafes have a reputation of having rejected every credit card they've ever swiped. Automatic bank tellers: Withdrawal can be made from any automatic bank teller found in any region of the country. Withdrawals can be made in either Lebanese or the US dollar. Lebanese cuisine is a mix of Arab, Turkish, and Mediterranean influences, and enjoys a worldwide reputation for its richness and variety as well as its Mediterranean health factor. Olive oil, herbs, spices, fresh fruits and vegetables are commonly used, as well as dairy products, cereals, fishes and various types of meat. A visit to Beirut includes the traditional Lebanese Mezze (Meza), an elaborate variety of thirty hot and cold dishes. A typical Mezze may consist of salads such as the Tabboule and Fattouch, together with the dips: Hommos, Moutabal, Muhammara, and more, and some patties such as the Sambousseks and finally, the stuffed grape leaves waraq 'inab, with of course the Lebanese flat pita bread which is essential to every Lebanese Mezze. Manqoushe: A Lebanese pizza, or at least that's what it looks like, the Manqoushe is a baked flat dough with either a mixture of local cheeses or thyme or a mixture of both on top. There is also a sweet version of it where the dough gets covered with a sugar and cinnamon mix before being baked. You can also get it with spinach or sabanikh, where the dough is wrapped around the spinach filling giving it a triangular shape. The one with spinach comes in a big and a small size. Manqoushe can be bought from all bakeries as well as from Forn Manqoushe, which specialize in this type of food and is usually had for breakfast. Costs between 500 LL and 3000 LL. The za'atar, spinach and sugar Manaqeesh usually are vegan, but sometimes the dough is made with milk. Hummus or Hummus bi-Taheeni: A dip made from chick peas with sesame paste, lemon juice, garlic, salt and olive oil. You can have it as part of Mezze, but it makes a full meal served with bread, onions, tomatoes, mint and pickled cucumbers, parsnips and olives. Hummus is usually vegan though especially in Syria and Turkey there are versions containing a kind of yoghurt. Mutabbal or Mutabbal Beitinjan: A dip made from baked and skinned eggplants with sesame paste, lemon juice and olive oil. As hummus this can be eaten as part of Mezze or as a full meal with the same bread and veg accompanying it. Usually vegan. Ka'ek: A different version of the classic bagel, only about a foot in diameter and hollow, normally filled with thyme but you can ask for cheese spread as well. The most common place to buy these are from the local street vendors that ride bicycles or motorized scooters and honk a manual horn, but you can also find it at major bakeries. Although not of Lebanese origins, they're quite popular and are always found near Rawcheh area, they're worth a try. cost about 1.000L.L . Roastery Nuts: Roasted nuts are certainly the local favorite appetizers particularly with the older people. Local brands have dedicated roasteries where customers walk in and order fresh, they produce some of the best nuts in the region, and certainly the most varied. Pecans, Cashews, Macadamias, Hazelnuts, Almonds, Pistachios, Peanuts its all there. Ask for Krikri in thyme, spice, or cheese flavor. Sweets: Every religious or national event sees stalls set up on sidewalks outside churches and in public squares, where traditional Lebanese sweets are sold such as: Maamoul, Ktaef, Halawet el Jibn, Halawet el Riz, and Ashta. If you're lucky enough to come across those be sure to give them all a try, otherwise visit any patisserie where the same sweets can be purchased but of lacking the same authenticity. Some patisseries offer vegan sweets. If you're on a tight budget it's best to rely on fruit and vegetables and to occasionally go to one of the eateries serving Lebanese fast food such as falafel, hummus, French Fries sandwiches and of course man'oushe which is by far the cheapest option. International fast food chains are considerably more expensive, but all major international fast food chains have opened restaurants in Beirut KFC, McDonald's, Burger King, Hardee's, TGI Fridays, Domino's Pizza, Pizza Hut, Dunkin' Donuts, Subway etc. Many local fast food restaurants have sprung up to compete with the major franchisers. Alcohol is readily available in Beirut. Many of Beirut's districts have their own fair amount of cafes, bars, and clubs, although many areas are dry or, while serving alcohol, do not have a vibrant nightlife. Two of the hotter nightspots, with the highest concentration of pubs and nightclubs, are Uruguay Street in Downtown, and Mar Mikhael, both located within close range in the Ashrafieh district. Hamra has quite a few pubs and bars as well. The best way to find out what's in and whats not is by checking the local press or simply going there and seeing for yourself. There is no curfew in Beirut, though expect most pubs and bars to empty by 3:00am-4:00am, and most nightclubs to empty between 5:00am and 5:40am. Uberhaus. Located on the premises of the old train station in Mar Mikhael they mostly play techno. During summer they also operate the outdoor club The Garten in BIEL. Locally brewed beer include Almaza and Laziza a non-alcoholic beer. There is also a microbrewery that started producing several styles of more flavorful beer in 2006, called 961 Beer. In 2010, a new beer was launched called LB Beer, which is brewed without the use of any corn or rice. it has gained a large following by the younger, independent minded crowd and is a regular staple at locally organized parties. All are worth a try when visiting. There are lots of hotels in Beirut's metropolitan area, ranging from cheap hostels to luxury suite hotels. Prices and quality vary across the spectrum, but if you look well enough, there's bound to be the perfect hotel inside whatever budget you set. Charles Hotel (Ain Mreissi), Rustom Bacha street face of YWCA. checkin: 2:00 p.m; checkout: 12:00 p.m. Charles hotel has 65rooms 120$. The Grand Meshmosh Hotel (Gemmeyzeh), St Nicholas Stairs,Walking on Gouraud street, walk up the Saint Nicolas stairway also called Gemmayze stairs, Sursock stairs, or the stairway of art for a few minutes. Coming by car on Gouraud street, drive past the Saint Nicolas stairway and turn right in the narrow street facing the Liban Post office until the roads ends at the stairway. Newly opened in 2016, very nice dorm and private rooms, also a top floor apartment 22-160$. Hostel Beirut, Rue 56, No. 11، Building: Akram al-Eid، Beirut, Geitaw. This is a low-key, social hostel in a central part of town, located within walking distance from the trendy bars, restaurants and art galleries of Armenia Street. The large common area, which includes a terrace, offers a great chance to meet other travelers. There's also a washing machine in the hostel and free breakfast in the morning. CYC guesthouse Shatila, Shatila refugeee camp. An opportunity to experience life in a Palestinian refugee camp. Extremely welcoming staff. Article about the guesthouse $15. Ramzi's Beirut, Pasteur Street,Just as you enter Pasteur street, you will find the old Lebanese building on your right, Facing Wild Discovery Shop. Ramzi's Beirut is a guesthouse with focus on giving a local experience. Ramzi, the owner and manager of the place makes sure every guest experiences Beirut as a local. He is known for his hospitality and love of parties. 45$ / Night. Since 2009, Lebanon has become a safe place and the number of tourists is dramatically increasing with more than 2 million annually. The US government's warning to travelers visiting Lebanon was lifted in mid-September 2009. Due to terror attacks in Lebanon carried out as part of the Syrian civil war, caution in necessary and it's advised to check security threats before travelling. Tourists including Lebanese expatriates are especially vulnerable to scams in Beirut, and often these relate to overpricing. There is a broad perception that all foreigners have a wealth of riches, and more disturbingly, that they are powerless to complain in the event of being ripped off. This apply mostly for the Arab countries wealthy people that come to enjoy free vacation to the country and are a target of scams due to their high income. A lack of regulation for many basic services in Lebanon e.g., public transport mean that the threat of a complaint will do little to set things straight, and your best bet is to be as vigilant as possible in the first place. - Let someone know where you are going and have someone expecting you on arrival. Try to avoid traveling alone. - Always carry your mobile phone in an easy to reach spot. - If traveling by taxi, always agree to the fare in advance, and pay only on arrival. - Ask for local recommendations on cab companies/operators - people are less likely to give you a bad experience if there's reputational damage involved. - In cabs, always pretend to be interested in the services of your taxi driver for future use e.g., day rates, extended private touring even if you are not, entertain this by asking for a contact number and tell your driver you'll get back in touch, maybe next week. If you have a good experience, it might even be a handy number to have. You may be warned about carjackings by your car rental company; a known trouble spot is the Emile Lahoud Autostrade linking Mt Lebanon at Bikfaya area in Beirut. Heed any recent advice. While the Lebanese are an affectionate and genuinely friendly lot, beware of anyone random introducing themselves to you on the street with a hug or a handshake that draws you in to an embrace, often with a line like "oh, its you! how are you!". The assailant then threatens the victim to hand over money/wallet/phone/jewelery in a way that avoids public spectacle. If you are unlucky enough to fall ill, head straight for the American University Hospital - aka 'the AUH' near the AUB campus - you will need to pay around $40 USD upfront cash or major credit card and be reimbursed later by your insurer. Pharmacies in Lebanon are able to prescribe drugs on-the-spot. While this is likely to be a boon for a minority of travelers, it can leave you even more ill than when you came in to begin with. Don't chance it see a doctor first. Escaping to the mountains near Beirut is a good option for those about to burn-out. Aley and Beit Mery are both near enough to the city at least 20-30 minutes by car, depending on traffic and connected by buses from Dora (Beit Mery) or Cola (Aley). They are generally quiet, clean and green and are considerably cooler than Beirut. The Daily Star, Independent daily English-language newspaper covering local, national and international news. Monday Morning, Independent weekly English-language journal. L'Orient Le Jour, a popular independent French-language newspaper. Many cafes and restaurants provide free WiFi to customers. Internet Cafes are plentiful in Beirut, and they should all provide printing and copying services as well as web surfing. GDS Global Data Systems, Sodeco Square, ground floor Sodeco Street, Ashrafieh, Beirut. 10:00 AM to 11:00 PM. $2.5 per hour. GDSonline, Downtown,Maarad street,287B. Beirut central district. 11AM till 1AM. $2.5 per hour. Once you leave Beirut, visit any of the other cities in Lebanon. The country is relatively small but because of traffic jams the journey to Tripolis or Tyr can take more than three hours. Depending on the season visiting, you can go skiing in one the six mountain resorts, or go to the beaches in Tyr or one of the beach resorts in Jounieh. Visit the national heritage sites around Lebanon; every city in the country has at least some form of ancient or historic site. Buses that head to the North city of Tripoli or to Syria and Jordan operate from the Charles Helou bus station, which is also the station for long-distance taxis that link Beirut to neighboring cities as well as Syria and Jordan. Charles Helou is located next to Port of Beirut. It can be difficult to understand the main bus routes at first but you can always ask, bus drivers are like everybody else in Lebanon, friendly and may be able to communicate in English or French.